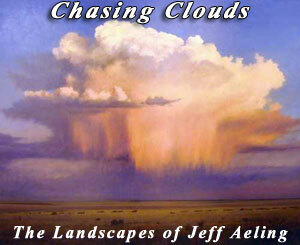 Landscape painter Jeff Aeling recalls driving from the Southwest to his home in St. Louis, MO, chasing a cloud. The cloud formation seemed to be moving at the same speed as his car, and as sunset approached and the light began transmuting to deeper and richer tones, Aeling debated when to stop driving. How could he be certain of the perfect moment to pull off the road and photograph the scene? When would the position of the cloud and his relationship to it be ideal to capture in a painting? For Aeling, the compositional decision-making process begins at such moments of inspiration and continues in his studio, where he deliberates over which parts of the observed scene to incorporate into his painting and what metaphorical aspects he might add to it. "Ultimately the process is about capturing the point where the landscape is clear and affords me an open view," he says. 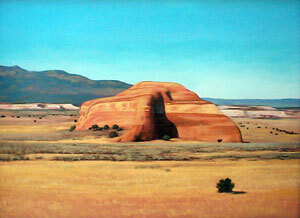 Jeff Aeling, Red Rock, UT, Oil on Panel, 18" x 24"
Aeling's reverence for the natural world echoes that of such 19th-century artists as Winslow Homer and Thomas Eakins. Like Homer, his study of lithography has informed his image-making, allowing him to evocatively transmit an experience to the viewer. Like Eakins, he believes in the value of photography as a tool. "I want to capture transitory light, which cannot be secured in any other way. Photography cannot be separated as a mode of perception because it comes from formative experience," says Aeling. "Both my father and grandfather were dedicated amateur photographers and imbued me with their love of the medium." Aeling's training with William McKimm at the Kansas City Art Institute was very much in the school of Eakins, stressing the study of anatomy, drawing, and composition. Aeling is a profound thinker, and he approaches landscape painting with a 19th-century sensibility that could have emanated from American transcendentalist philosopher Ralph Waldo Emerson, whose The Conduct of Life has been Aeling's philosophical guide. Emerson was not sentimental about nature, believing it was not concerned with us but us with it. Aeling believes the same is true for the observer of American landscapes. "In a very real way, nature exists independently of your desire to see and experience it," he says. "Whenever I go surfing I know I have to pay attention to the ocean since the reverse is unrealistic. Nature is in you and outside of you at the same time." 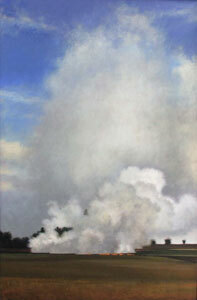 Jeff Aeling, Stubble Fire West of Salina, Oil on Masonite, 36 " x 24"
Aeling's affinity for the landscape developed in childhood as his family traveled throughout the United States and Europe following his father, an Army physician, from post to post. These extensive journeys imbued Aeling with a knowledge of and a love for a variety of landscapes. Two dramatically different locales had a profound impact on him: "The remote and isolated Hawaiian landscape and Colorado with the Rocky Mountains rising from the plains really impressed me," he says. His career has followed a circuitous path, evolving from art student, to theatrical scene designer, to owner of a mural and pattern design business creating antique finishes for architects and interior designers, and finally to full-time artist. Even while supporting himself working in other fields, Aeling never stopped painting. And he persistently explored other imagery and media, ranging from collage and encaustic (the ancient wax and pigment painting that dates back to Egyptian art) to photography and portraiture. Today, the influence of this eclectic mix of interests is apparent in much of his artwork. Jeff Aeling, Sunset, Washington Coast, Oil on Panel, 8" x 10"
In 1996, Aeling won a Grand Arts Foundation grant that led to a major solo exhibition of his work at the Grand Arts Gallery in Kansas City. Titled The Layman's Guide to the Passing of the Millennium: For the Prevention of Hysteria, the exhibit was comprised of more than 100 dioramas, assemblages, collages, and paintings. It attempted to break down society's anxiety pertaining to the change of the millennium by examining the components of the anxiety and the search for a safe haven in which to house it. Perhaps as a consequence of the exhibit's large and ambitious scope, the media roundly criticized it. Nonetheless, it was well attended and highly publicized and resulted in Aeling securing a national profile and, as a result, his first major gallery. At last he was able to concentrate solely on painting. Today, Aeling travels for about four months annually in a relatively unstructured mode; for the balance of the year he has a defined studio routine. He's up early, makes coffee, walks his dog, and heads to his studio. "I find the mornings so exciting. I cannot wait to get into my studio," says Aeling. "I love the first four or five hours of the day, when I confront the challenge and hard work of painting with fresh eyes." Aeling believes his artistic process springs from simply "doing the work." He paints every day, working with oils on panel and standing at arm's length from his compositions. Even on those rare occasions when he feels unfocused, Aeling will mechanically paint and often discovers inspiration as he works his way through an artistic stumbling block. Jeff Aeling, Afternoon Near Galisteo NM, Oil on Panel, 18" x 24"
Aeling is extremely knowledgeable about the history of art, counting among his artistic heroes such diverse influences as Venetian Renaissance painter Giovanni Bellini and contemporary German painter Anselm Kiefer. Bellini, known for his concise emotional expression, has had a particularly profound effect on Aeling's artistic vision. "The divine light on the landscape in Bellini's St. Francis in the Desert points the way to the natural light of the landscape so often found in American art," he says. "It is the divine light of understanding, and for Bellini to paint this image he had to have had an integral sense of recognition-he had to experience this divine light to paint it. This experience is what happens to me." And Aeling admires the beauty, bravery of subject matter, and directness found in Kiefer's paintings. The impact of both European and American influences is evident in Aeling's art. In European art nature is seen as dangerous, whereas in America nature is an integral part of our national identity. The expansive space of Cumulus Cloud with Virga, for example, is comprised of three basic elements: sky, cloud, and a deserted landscape with a palette of fundamentally four colors-blue, white, orange, and a warm green. The rain cloud is on the cusp of drenching the plains below. It demands the viewer's attention through the force of an almost radical composition and the intense use of light. At first glance this seems a nuclear image, and it is hard to shake off the sense of doom that this bottom-lit scene creates. 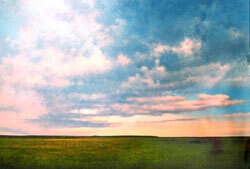 However, it is Aeling's intent to make another visual point entirely-that the cloud's vastness is a metaphor for the vastness of the American landscape itself. The power is in the natural events that Aeling has scrupulously translated as well as in the harmony of all the elements with the spaces in which they reside. Such glorification of nature is wonderfully Walt Whitman. Jeff Aeling, Sunset over Canyonlands, Oil on Panel, 10" x 14"
In Aeling's painting Cumulus Over the Comanche Gap, he once again explores familiar ground (and brings to mind the many works French artist Paul Cézanne did of Mount Saint Victoire in Provence). This vertical work offers a brilliant sunset in its last minutes. At the center of the painting an enormous cloud shares the last of a bright blue sky as it is overtaken by darkness. In the upper reaches of the work, slate gray clouds push the viewer's eye to the last moments of the sun's disappearing golden light. It is a picture fraught with quiet emotion and spiritualism. 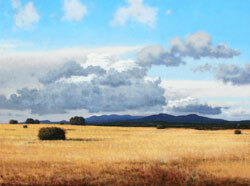 Despite the presence of European artistic elements, Aeling's landscapes, low and wide, seem quintessentially American. It would appear there is spiritual communication going on between the observer and the image without forsaking the reality of the place. In Cattlepond South of Cottonwood Falls, KS, a lyric spiritualism and devotion to place is illustrated with dramatic beauty. In it, a tranquil blue pond lies in the center of the picture plane and is flanked on the top by a misty, gray-blue sky and in the foreground by a field of tall, spiky grass. The grass is portrayed with particular attention to the depiction of texture and color, which Aeling achieves through gestural strokes. The contrast between the translucent sky and the stiff grass at the front of the picture create a tension that forces the viewer to look at the pond. The colors are dazzling and the texture of the grass intensely evoked and pointedly contrasted to the coolness of the water. Are we to think of this as a refuge? Aeling leaves this to us to decide for ourselves. This use of drama and posing of questions makes Aeling's work particularly intriguing. After living in the Midwest for most of his life, Aeling is planning a change of his own landscape next year: He is returning to Hawaii, his home for several years during his youth. 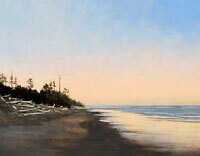 He has visited there over the years and made a number of paintings but is now ready to make it his permanent home. One can only imagine the clouds that Aeling will chase in that enchanted place and how their role may change from central character to a player in the scene. Barbara Pflaumer lives in Los Angeles. She has worked at the Philadelphia Museum of Art and the Los Angeles County Museum of Art and as a consultant to museums throughout the United States and Europe. 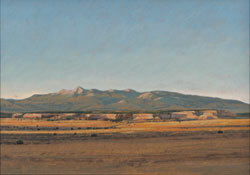 Jeff Aeling, Sunset near Clayton NM, Oil on Panel, 30" x 48"